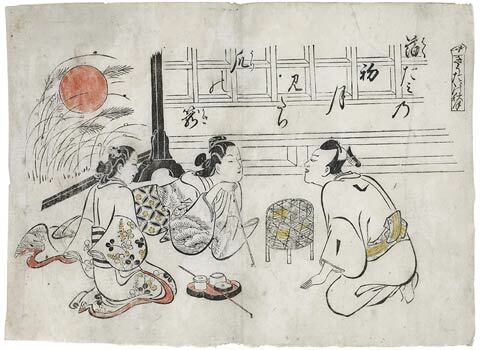 From the album “Eight Views of Yoshiwara” A prostitute in the company of her shinzō is engaged in conversation with a visitor while resting on her pipe. On the screen behind her is an autumnal motif, a full moon behind susuki grass. The designation kyūtai in the title box is open to various interpretations in the allusions it makes to a “round form”. However, the somewhat ambivalent guest kneeling in front of the lascivious, waiting beauty only seems to have eyes for her full-moon face. Poem: Now he gazes at the rising moon of gold leaf, now shyly at the basket filled with melons. A courtesan leaning on her pipe and accompanied by her maid converses with a visitor. The standing screen (tsuitate) behind her is decorated with a typical autumnal motif, the full moon, seen through swaying susuki grasses. The theme enjoyed great popularity from the golden epoch of the Momoyama period (1573-1603), which was golden in a literal sense. On surviving folding screens the full moon is actually mounted in gold leaf, or in silver, or sometimes as applied metal spheres. The kimono patterns of the two women, pine and brush clover (hagi), also correspond to the season of the year. The shining full moon is to be understood in the first instance as a lyrical allusion, with which one can associate maturity, beauty and luxury. But then there is the basket with long melons among ferns. Presented so prettily, this represents quite a substantial autumnal gift – even today in Japan, choice natural products are packaged in this careful manner – but a further meaning is also intended: the basket serves in both poem and composition as a pendant to the full moon behind the courtesan, which thus in turn takes on an altogether cruder symbolic meaning. The young man looks backwards and forwards between the moon and the basket. With a few lines Masanobu has succeeded in masterly fashion in portraying the undecided young man and the lascivious waiting courtesan. This leaf proves to be exemplary fort he early phase of Japanese woodblock art which achieved a symbiosis, never to be repeated again, between coarse vitality of the image and absolute refinement of the artistic means. The term kyūtai, which appears in the title, has several meanings. Here the allusion is probably initially to the meaning „round shape, round object“. Reference is made in the poem to full moon and melons as „round shapes“. The kneeling man is not gazing – as the poem would have us believe – at these objects, but rather, as if transfixed, at the face of the courtesan, which is thus associated with the other „round shapes“. In literature the face of a beautiful woman is often compared with the full moon.